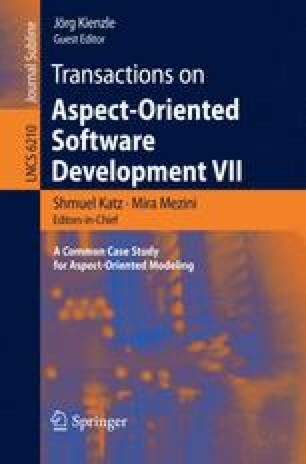 The idea behind Aspect-Oriented Modeling (AOM) is to apply aspect-oriented techniques to (software) models with the aim of modularizing crosscutting concerns. This can be done within different modeling notations, at different levels of abstraction, and at different moments during the software development process. This paper demonstrates the applicability of AOM during the software design phase by presenting parts of an aspect-oriented design of a crisis management system. The design solution proposed in this paper is based on the Reusable Aspect Models (RAM) approach, which allows a modeler to express the structure and behavior of a complex system using class, state and sequence diagrams encapsulated in several aspect models. The paper describes how the model of the “create mission” functionality of the server backend can be decomposed into 23 inter-dependent aspect models. The presentation of the design is followed by a discussion on the lessons learned from the case study. Next, RAM is compared to 8 other AOM approaches according to 6 criteria: language, concern composition, asymmetric and symmetric composition, maturity, and tool support. To conclude the paper, a discussion section points out the features of RAM that specifically support reuse.